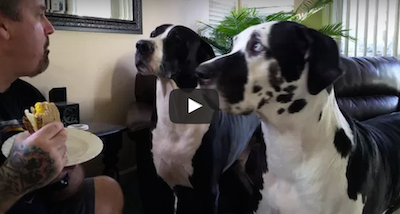 Dad Refuses To Share His Sandwich - Now Watch The Big Dog In The Back! Just when dad thought he could sit down and enjoy his homemade egg salad sandwich, his dog Dinky had other plans. Plans to make dad share! Watch Dinky as he proceeds to throw a hilarious that, rumbling and grumbling and talking up a storm. I think Dinky deserves some of that sandwich!